ISBN 9790006544455. 31 x 24.3 cm inches. Key: E-flat major, f minor. Text Language: English/German. Preface: Clive Brown. 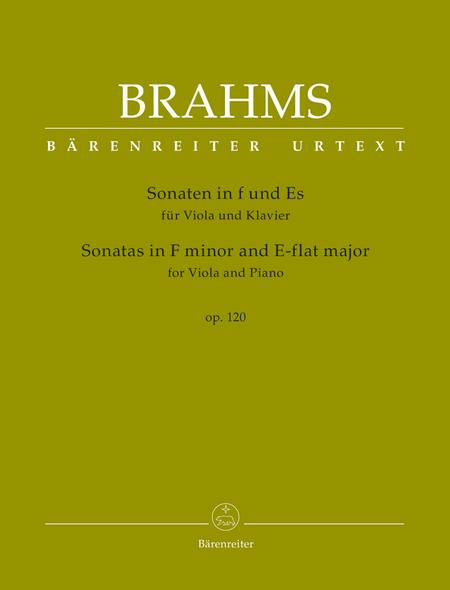 Barenreiter's pioneering new scholarly-critical editions of Brahms' works for one instrument and piano are edited by a team of musicologists who are also performers. They offer today's musicians not just a reliable musical text based on all known sources, but also a comprehensive approach to the works, which aims to place them in their historical context and to elucidate the complex of meanings that the composer wished his notation to convey to performers. 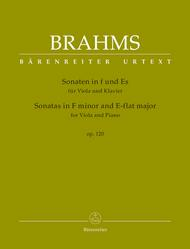 An integral part of Barenreiter's Brahms publication complex is a text booklet which approaches general performance practice issues of the 19th century with regard to e.g. tempo, rubato, rhythmic flexibility and articulation. Furthermore musicians will find valuable information concerning vibrato, portamento and bowing. Last but not least characteristics of Brahms' own piano playing as well as that of his circle and contemporaries are discussed. Barenreiter's new Brahms complex also importantly brings two neglected works back into the player's hands, namely the splendid versions of the op. 120 sonatas, originally written for viola or clarinet and piano. Brahms' arrangements for violin and piano unaccountably disappeared from the standard repertoire early in the 20th century. In these versions Brahms did not simply adjust the solo part for the violin, he made many alterations to the piano part, casting thought-provoking light on the clarinet and viola versions.